As the contents in your notebook change over time, you might decide to delete sections that you no longer need. Caution: When you delete a section from your notebook, all of the pages contained in that section, as well as the notes on those pages, will also be deleted. Right-click the section tab and click Delete. If you delete a section and immediately change your mind, press Ctrl+Z on your keyboard. This handy shortcut will undo the last thing you did—including deletions. 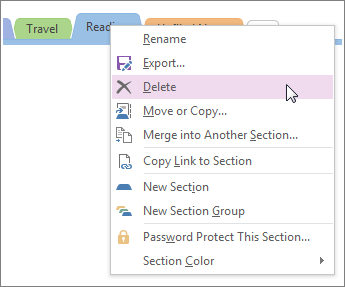 If you’ve mistakenly deleted a section, and are using OneNote 2010 or later, go to History > Notebook Recycle Bin to recover the section.